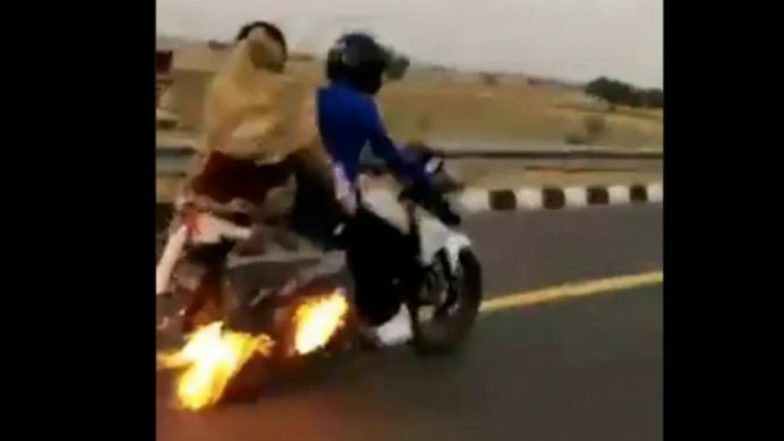 Etawah, April 15: In an unusual scenario from Uttar Pradesh, the police officers on Monday prevented a major accident when it chased down a bike, TVS Apache, with flames cruising down the road. A video of the occurrence is going viral on twitter that was shot from a PCR (Police Control Room) van in Agra Expressway. A bag attached to the bike, with two people on it, caught fire. Milkman Sets His Royal Enfield Ablaze After Traffic Police Asks Him to Show Bike Papers in Gurugram. In the video, a PCR can be seen chasing down the bike while putting on the emergency siren. The clip shows that cops sensed that something is wrong with the two-wheeler and started chasing it. When they neared the bike, the policemen shouted the rider to stop who was completely unaware of the fire. Man Seen Riding a Batman-like Bike on Mumbai's Marine Drive Without Helmet; IAS Officer Alerts Mumbai Police. The biker was with a woman and a kid. The police policemen asked him to stop the bake and carefully park it on the side. The cops also helped to douse the fire. In the incident, no one was injured. If the fire would have gone unnoticed it could have spiralled into a fatal accident.